Purple and white striped silk taffeta set of bodice and skirt; worn over crinoline; pagoda sleeves with bows; frills on bodice and hem of skirt. 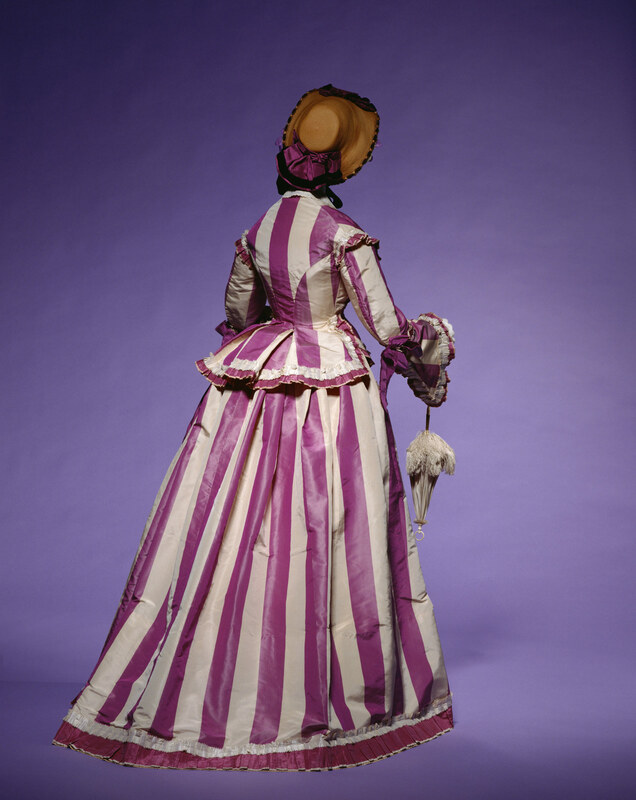 A dress featuring bold stripes in purple, the fashionable color during that era. In 1856, the chemist William Perkin (1838-1907) discovered the world's first synthetic dye, mauveine. This was soon adapted into textile dyeing and the color which resulted, termed "mauve", before long attracted a great deal of attention. Later, more and more synthetic dyes for other colors shades were discovered, too, which immensely helped the dyeing industry, formerly dependent on expensive natural pigments, to proceed towards industrialization. Since it thereby became easier to acquire dyed textile, people enjoyed experimenting with all kinds of colorful combinations.